Valentine’s Day is the one-time Jeremiah and I stay in. We hate the crowds and waiting past your reservation time for a table. We eat out enough so we don’t feel like we need to mess with it on Valentine’s Day. Instead, it’s the one night we prepare an all-out meal and sit down at the dinner table to eat it. This year, the plan was for spaghetti. In fact, I’ve turned Jeremiah into someone who prefers to eat my Great Grandma Reith’s spaghetti sauce over anything you can get from a jar or at a restaurant. That was the plan. On our way home, we stopped at Sprouts to grab some bread. Unfortunately, finding bakery bread has turned into a nightmare because everything in that area seems to have barley. Since I’m allergic, it’s getting way harder to make garlic bread ourselves. While in the store, Jeremiah spotted some lobster tails on sale for $4.90 each. That’s crazy ridiculously cheap! We know from our trip to Maine why they are so expensive. A change of dinner plans occurred. “Why don’t we have lobster tails?” said Jeremiah. I said, “We’ve never made them. Do you know how to cook them?” Jeremiah used his phone to research a recipe. It looked simple and quick enough. Then, the next question was what we would eat with them? That’s when I throughout this recipe from our wedding cookbook for cheesy potatoes. Needless to say, what should have taken less than 20 minutes to make for dinner, turned into a late-night Valentine’s Day dinner. We even grabbed something in the McDonald’s drive-thru, which we never eat, to hold us over. Jeremiah goes way back with the Fox boys (brothers – Kelly and Travis). Kelly and Travis grew up with the Slater clan. From what I understand, I think their dads met through work and became good friends. I also learned that Jeremiah’s mom used to babysit the boys when she did home daycare. The Fox’s grandma told me at our wedding that she considers Jeremiah almost be like a grandson because he spent so much time with her when they were kids. According to Erin, these potatoes are the reason her husband Kelly married her. Jeremiah says Kelly was smitten on her from the moment he met Erin. 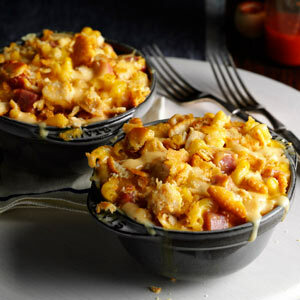 This recipe is similar to my mom’s cheesy potatoes. I like Erin’s recipe through because it feels a little less rich and just the right amount of cheesy to make this side dish a little more often. My biggest pet peeve is when someone says they made cheesy potatoes and you can barely taste the cheese. Not the case with this cheesy potato dish at all. And on a side note, we probably ate a lobster dinner complete with cheesy potatoes, garlic bread, and monster cookie cheesecake for less than $8 a serving. If you add in a glass of local vineyard wine, it probably came out to $12 a serving. In fact, that’s cheaper than we spent on a fast-casual dinner at Chipotle of nights ago. And it’s definitely cheaper than if we had gone to one of our favorite steakhouses. Melt butter. Add cream of chicken and sour cream. Add garlic salt and pepper. In an extra-large bowl, pour mixture over hash browns. Add cheese and combine. Pour into sprayed 9 x 13 baking dish. Bake for 45 – 60 minutes at 400 degrees. A few ago weeks, I was going through my Pinterest account looking for some new recipes. This is a new one we tried and really liked. I hope you like it took. In a large bowl, mix garlic, ranch seasoning, cream of chicken, sour cream, pepper, and water. Place chicken in Crockpot and cover in sauce. Cook for 6 hours on low or 4 hours on high. About 30 minutes before it’s done, add cooked pasta and bacon. I used reduced sodium cream of chicken soup and light sour cream. I substituted a spiral pasta. Instead of mixing in the bacon, I cooked half a package and just sprinkled on top with parsley. My days used to be long because I’d stay at work late…usually trying to keep up on my inbox. When I got home, Jeremiah had either finished cooking dinner or it was close to being done. Oh, the good old days. A few weeks ago, Jeremiah took a job downtown. Part of the deal in him taking the job was for us to carpool. Although our offices are only about five miles apart, it takes me – on a good day – about an hour to get to and from work. I also have a new level of traffic stress sitting in bumper to bumper traffic or dodging car accidents in mid-town. By the time we get home, we are tired, hungry, and stressed. One thing that has become a saving grace for us is our crockpot dinners. For Christmas, Jeremiah bought me a Crockpot with a timer. (And yes, I requested this gift.) And thanks to Pinterest, we can find lots of tasty recipes to cook in it. This is a recipe we made for dinner last Monday. We got done eating our serving and Jeremiah said, “Do we have more?” I seconded those words. May you enjoy this recipe as much as we did. Mix together the first four ingredients in a bowl. Salt and pepper pork chops and place in the bottom of the Crockpot. Pour mixture on top of pork chops. Cook on high for 4-5 hours or low for 8-10 hours. Recently, I spoke at Heritage United Methodist Church about hunger. For lent, they are doing a huge food drive for where I work. At the end of the presentation, they gave me a thank you gift that included a church cookbook. As you know, I love these cookbooks because people always share their best recipes. Here is the first one I tried. Mix first four ingredients in a bowl. 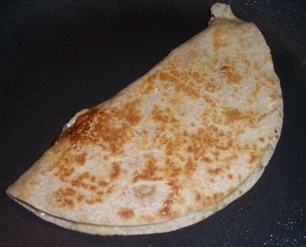 Spread ¼ c. in a tortilla and fold over. Cook in a frying pan or George Foreman Grill. Top with salsa or guacamole. I’m not a huge fan of Mexican cheese so I used 2% cheddar cheese. I add some cilantro to the mix. Another option might be some veggie bacon. Sure, who doesn’t love a traditional turkey dinner on Thanksgiving? In my family, that means both turkey and ham. My nephew prefers ham and my grandfather won’t eat bird meat. With six people eating this feast, it leaves a lot of leftovers. My question after eatting leftover for a day or two is: what else can I make with? Below is a recipe from the December2013/January 2014 issue of Taste of Home’s Simple and Delicious that my family will be trying. Cook macaroni (or pasta of your choice) according to the package directions. Meanwhile, mix soup, milk, Parmesan cheese, mustard, and seasonsing together. Add meats and mozerella cheese. Drain pasta and add soup mixture. Pour into a 13 x 9 pan and top with crackers. Bake uncovered at 350 degrees for 25-30 minutes. You can cover and freeze this casserole. Thaw in the fridge overnight and bake as directed.